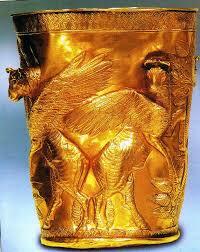 The Gold Bowl of Marlick This goblet was found at Marlick in the Valley of Gohor Rud (Crystal River) in Iran. This item and many others excavated from an archeological site from November 1961 to October 1962. The goblet is 17.5 cm high and 14 cm wide and is almost pure gold. This is part of a collection that is being housed at the Muzeh Iran Bastan (Archeological Museaum of Teheran). The images are done in repousse (hammered into relief from the reverse side). There are two bulls standing on hind legs on each side of a palm tree (possibly the “Tree of Life”). The heads of the bulls are hammered out from the body of the vessel. the wings and body of the bull are finely detailed, the details are done in linear engraving. The base of the bowl has a petal like pattern and the top has a triple lined guiloche band. Little is known of this culture but their fine work in gold and silver. It has been surmised that these items were for funereal purposes or for the dead to use in the afterlife. Some of these bowls were also made of clay and silver, suggesting the status of the person being buried. The Ziggurats nearby had looted long ago and this site only escaped looters because of the heaps of trash that covered the archaeological site.